Rare Large Antique French Blue 'Bulle De Savon' Opaline Casket Box with Smooth Mounts and Original Key. 'Bulle de Savon' Opaline Glass Glows Fiery Red When Put Up to the Light. 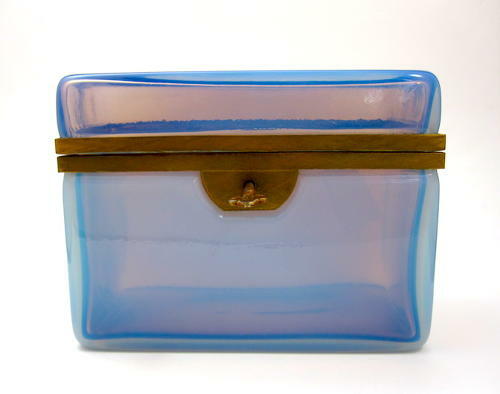 This Opaline Casket is a Rare Colour, Pale Blue on the Outside and Purple/ Blue / Orange on the Inside. Its Changes Colour in Different Light.